A Tale Of Two Birds | The Perks of Having Cancer! Nearly a month ago, I found a bird’s nest in a flower pot which set me in to high gear gardening mode, and ultimately (I believe) landed me in the hospital. 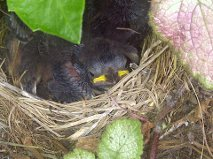 The good news is, the baby birds have hatched and are quickly growing. They look like they are almost ready to fly the nest. The bad news is, my infection never fully healed and it landed me right back in the hospital again. I got out yesterday. This time I had my private room, so unfortunately I have no tidbits of overheard “ward conversations” to share. As my friend Nancy just blogged (Pink Underbelly), “Once a cancer patient, always a cancer patient.” So while I am striving to put the whole cancer scene behind me, it is hard to do so when I have to go around wearing some kind of pump to drain fluid from my surgery which never seemed to fully heal. Not to mention the obvious reminder of my cancer ordeal, my new “hair” (to use the term loosely). It actually looks more like a tuft of feathers on the top of my head as opposed to hair. Every time I look in the mirror, I am reminded of a cockatoo. Well, I guess I will have to “perk” myself up, so I am off to my garden, cup of coffee in hand, to sit and watch the birds. Hopefully they won’t mistake me for one of their species and try to mate with me. 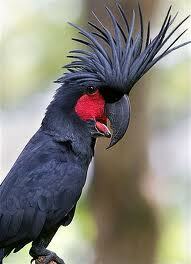 That is one gorgeous cockatoo – if your hair is like that, I’d say rock the look! SO sorry you’ve been in the hospital again. Glad you are home and hope you feel much better very soon.